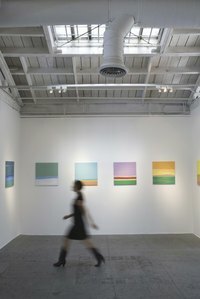 An art exhibition show involves many expenses, from renting a venue to publicity, printing banners and providing food and drinks for the guests. The ideal way to cover these expenses is to find sponsors. Famous artists and art shows may easily get sponsors, but even if you are a first-timer you can use a few tricks to get funding for your event. Write a detailed plan of the art show you want to produce. Include the location, theme, names of artists and their work, previous events featuring the participating artists, the budget you need to raise, advertising tactics and the number of people expected to attend. Prepare to offer sponsors some publicity in exchange for their sponsorship. Learn what is important to each potential sponsor. Offer mentions in the program, free tickets to the show or even art pieces for them to display in their homes or offices. Find art publications, catering companies, galleries, museums, printing shops, art supply stores or large corporations in your area as potential sponsors. Research sponsor lists of other art shows and events. Approach their business competitors instead if they have limited sponsorship budgets and cannot sponsor your show. Contact the publications and companies you find via email or phone and ask to talk to the person responsible for sponsorships. Briefly state the purpose of the call and ask for an appointment as meeting someone in person and letting them know about your show details is more effective and likely to get you a sponsorship than just talking on the phone. If you use email and you get no response after one week, call to follow up. Meet with the people responsible for offering sponsorships to present them with your plan and images of the artwork your show will feature. Be brief and clear. Emphasize the benefits of sponsoring your event such as free publicity. Mention sponsors already committed, except for business competitors of the sponsor you are trying to get. Follow up with your potential sponsors, as some may need time to think about it or ask their superiors for budget approval. Phone them a few days after your meeting. Be confident and clear when presenting your plan. Rehearse before you call or meet the potential sponsors, but try not to sound like you are reading from a script.